Danger Below? New Properties Hide Abandoned Oil And Gas Wells Around the country, houses, schools and shopping centers are being built on old oil and gas fields — and hidden underground are millions of abandoned wells that are not monitored for leaks. A contractor prepares to cut off the top of a coal bed methane well near Gillette, Wyo., in 2015. 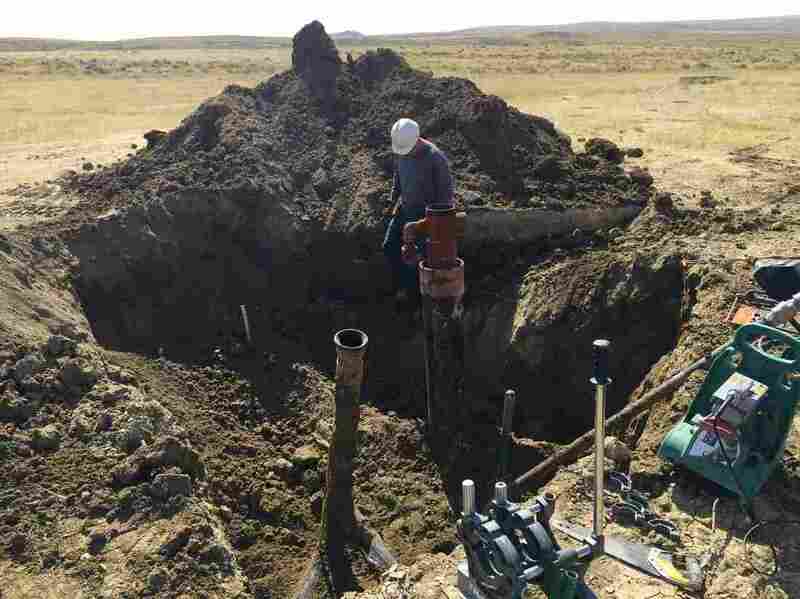 It's one of thousands of abandoned, plugged wells sprinkled throughout Wyoming and Colorado. 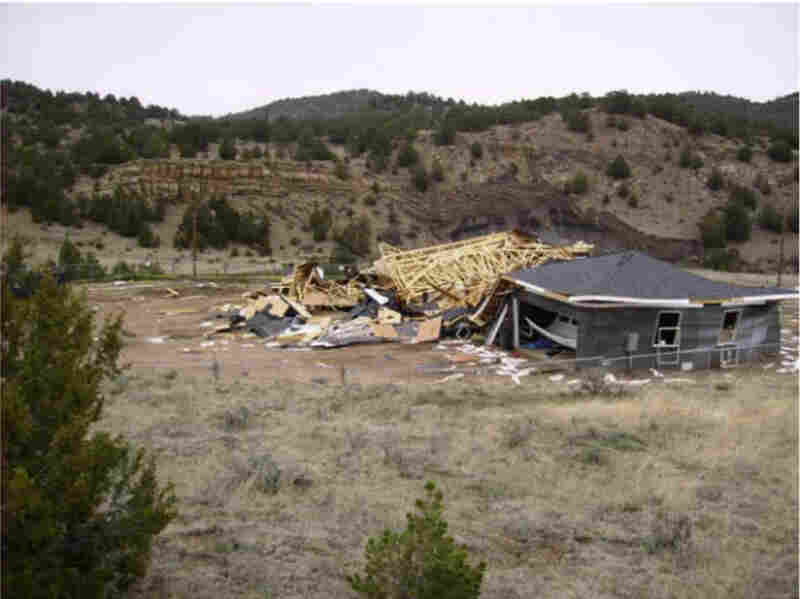 In 2007, Rick Kinder was working for a contractor, building a house in southern Colorado. The workers had just finished putting in all the doors, windows and sealing the house. Kinder and a colleague were working in the crawlspace, hanging insulation. "And we just heard this big roar and then a big boom, and it threw us against the walls, and it just blew the whole top of the roof off," Kinder says. In 2007, Rick Kinder was building this house in Trinidad, Colo., when it blew up. An abandoned gas well leaking methane was underneath the house. He and his colleagues didn't know it, but they were building on top of an abandoned gas well that was leaking methane — an odorless and highly explosive gas. No one was killed in the explosion, but the blast sent Kinder into cardiac arrest. He ended up having a quadruple bypass. "And I lost probably a third of my heart, the muscle," he says. In many parts of the country, areas that are now full of houses and schools and shopping centers were once oil and gas fields. You wouldn't know it by looking, but hidden underground, there are millions of abandoned wells. New development happening on top of those old wells can create a dangerous situation. In most states, there is no requirement for homeowners to be notified about abandoned oil and gas wells on their properties. Jeff Parsek bought his house in a neighborhood of cul-de-sacs and suburban ranch homes on the south side of Fort Collins, Colo., in 2004. He had no idea that state records show there is an abandoned well in his driveway until he was asked by NPR. But unlike other homeowners who responded with curses and slammed doors, Parsek was unfazed by the news. "If it started to emit something, then I might [be worried], but to this point I'm not concerned," he says. The trouble is that it might be hard to know if the wells were emitting something. When a well stops producing commercial quantities of oil and gas, companies "abandon" it, usually by filling the well with cement to stop the flow of gas and fluids. The industry considers that the end of a well's life. "It's not rocket science to plug these wells," says Mark Watson, Wyoming's oil and gas supervisor. "It's a hole in the ground that's pretty deep. You set cement, and cement lasts a long time." The belief that a well is dead once it's plugged means there is no systematic monitoring for leaks. We simply don't know what percent of abandoned wells are leaking — but we do know that at least in a handful of cases, it's happened, as it did to Kinder. Kinder had worked in the oil and gas industry for nearly 30 years. If anyone were going to recognize an old well site, it would be him. "There were no signs, no nothing there that would give us an indication that somebody had built there or had done some work," he says. Three maps by Inside Energy explore the locations of abandoned wells in Colorado and the expansion of residential areas into historical oil and gas fields. Across the U.S., from Pennsylvania to Texas to California, there are millions of abandoned wells. But their locations are either unmapped or poorly mapped. Rob Jackson, a researcher at Stanford University, says keeping track of them is a low priority. "When a state sees a well is plugged, they typically put a check mark by that well in a database, or in a file somewhere, and they don't do anything for the most part," he says. Unless a well starts leaking fluids or a house blows up, the assumption is that everything is fine. Jackson says it's partly an issue of states not having the resources to monitor the wells. A map by Inside Energy shows abandoned wells in Wyoming. "But I also think the states aren't that interested in some cases, in many cases, in the data," he says. "I'm not sure that they really want to know." In the Canadian province of Alberta, it's a different story. Theresa Watson, an engineering consultant and former Alberta energy regulator, started pushing for better tracking, monitoring and regulation of abandoned wells back in the early 2000s. That was when people started to move into rural areas that were once oil and gas fields. "If you don't measure it, you don't know what kind of risk you have," Watson says. "I mean, ignorance is bliss, I guess, but I think most people will tell you that they'd want to know." Watson recommended not only monitoring abandoned wells near homes, but also outright prohibiting construction on top of them. "From the public safety perspective, even a slow leak into a building can cause an explosion hazard," she says. Alberta now has a 15-foot no-build zone around abandoned wells. Similar rules are lacking in most of the U.S., even as new development is encroaching on old oil and gas fields in places like the Front Range of Colorado. State oil and gas regulators say the situation is out of their hands. "We really try to discourage the construction on top of old wells," says Stuart Ellsworth, engineering manager for the Colorado Oil and Gas Conservation Commission. But he says any actual prohibition is up to local governments that permit development. In turn, many of those local governments see abandoned wells as the state's problem. For those who can potentially be affected by these wells, just having rules that will protect them is a priority. Kinder says he doesn't care who ends up making rules about building on top of abandoned wells — he just wants somebody to do it. "Somebody needs to be held accountable for it," he says. "To me, the most important thing is it doesn't happen to somebody else. It doesn't need to happen to somebody else."